A combination of rainy, windy weather early in the week led to a low number of birds banded. Misty mornings Tuesday and Wednesday gave way to clearing clouds in the afternoon and as the sun emerged the goldenrods and asters on the property became covered in industrious insects. The weather calmed later in the week but no big pushes of migrants have come through yet at Manomet. We ended the week with 44 new birds banded and 37 recaptures bringing our totals to 288 new birds banded and 187 recaptures so far this season. Monday’s storm with strong east winds brought some juvenile Bonaparte’s Gulls to the shore at high tide where they joined a soggy Great Blue Heron trying to shelter from the wind and rain. Wednesday had our first new species for the week, a foggy morning with active birds. Early on the first net run, a screech of surprise rang out through the misty calm of the morning at Net 3. Jillian extracted the sleepy bird and carried it back to the banding lab. 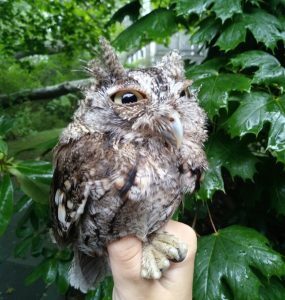 Heard constantly throughout the spring proclaiming their territory on the net lanes, the Eastern Screech-Owls apparently had a successful nest this year. The hatch-year was banded and released behind the banding house, where it confidently flew off, likely to get some well-deserved rest. Our first Blackpoll Warbler was also banded Wednesday and a buck with no velvet left on his antlers was wandering the net lanes, a sure sign of the coming fall. 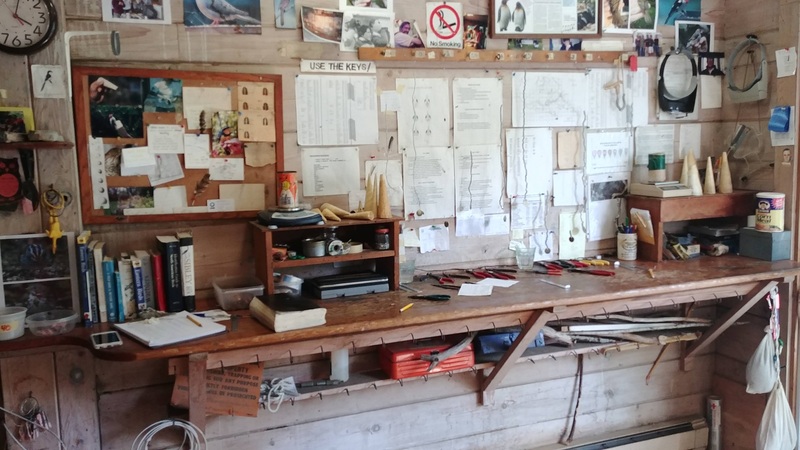 Flycatchers have also started to arrive in the banding lab, we banded two Alder Flycatchers and a Yellow-bellied Flycatcher last week. With only subtle overall differences in appearance, measurements must be taken to determine the species of the Empidonax Genus. On sunny days in the late afternoon, a large number of winged ants take to the sky from underground tunnels beneath the garden. Dragonflies take advantage of this and are seen gobbling up these bugs. 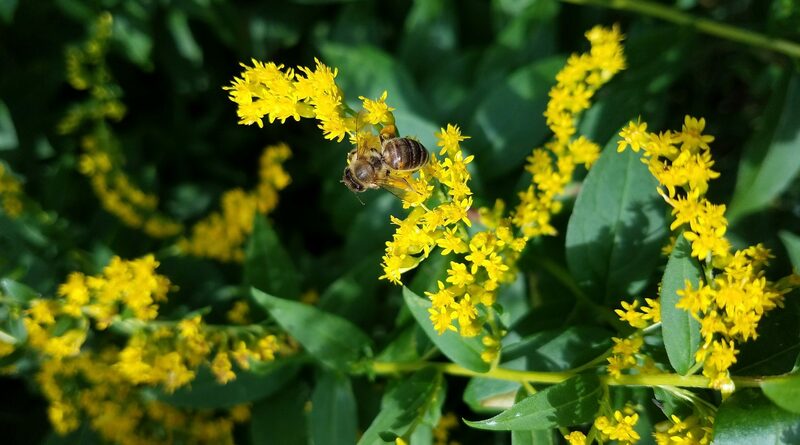 Goldenrods around the property also are host to diverse numbers of insects including honey bees and the boldly striped yellow and black Locust Borer Beetle.